Kalisto is a hybrid Superstar who has always felt destined for big things. Born in Chicago, but raised in Mexico City, the luchador is no stranger to sports-entertainment. Known for his innovative speed and agility, Kalisto conquered Mexico before transporting his skills to the United States. Kalisto’s lightning-quick moves and extraordinarily accelerated pace make him a can’t miss prospect on NXT. After teaming with fellow luchador Sin Cara to snag the No. 1 Contenders’ status, the two high-flyers accomplished the unthinkable, bringing to an end The Ascension’s record-long NXT Tag Team Championship reign at NXT TakeOver: Fatal 4-Way. The masked pair kept their momentum going at NXT TakeOver: R Evolution in December, overcoming the challenge of The Vaudevillains. The Lucha Dragons’ reign came to a close in early 2015, however, when the young pairing of Wesley Blake & Buddy Murphy shocked the WWE Universe by defeating Kalisto & Sin Cara for the titles! During their title rematch at NXT TakeOver: Rival on Feb. 11, The Lucha Dragons lost again to Blake & Murphy on WWE Network. Kalisto’s next big milestone came in February 2015 when The Lucha Dragons made their debut as a team on the WWE main roster. 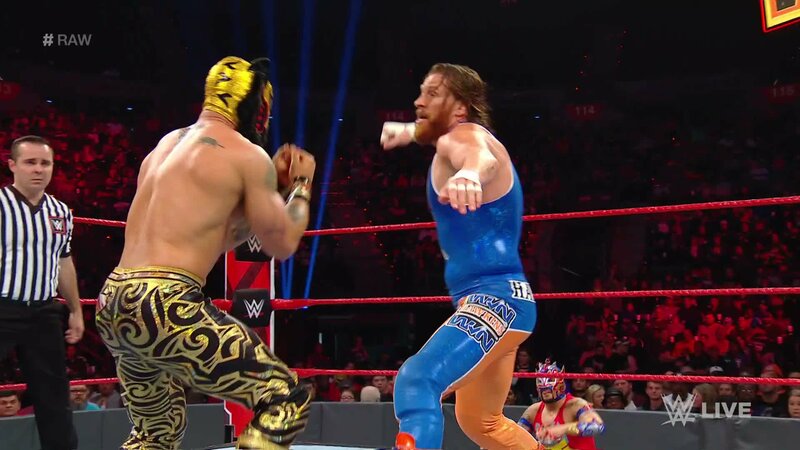 In Kalisto’s first WWE appearance, the Dragons overcame WWE veterans Curtis Axel & Heath Slater. Now splitting his time between WWE and NXT, Kalisto again fought inside the yellow ropes on the March 18 edition of NXT, losing to Tyler Breeze in an exciting and closely fought matchup. Then, one night after WrestleMania, the gravity-defying Superstar made his Raw debut in an action-packed 8-Man Tag Team Match. Whether in NXT or WWE, the Superstar known as “The King of Flight” plans to conquer the competition while demonstrating the time-honored art of lucha. L'athlétisme d'Apollo Crews lui a permis de contrôler le match contre Kalisto dans le Kickoff de WWE Extreme Rules, mais Titus O’Neil a coûté par inadvertance le match à son protégé. Du Match d'Elimination Chamber pour le titre de Champion de la WWE au Tag Team Turmoil Match pour les titres de Champions par Équipes de SmackDown, découvrez les résultats de WWE Elimination Chamber 2017. La bouche de Dolph Ziggler lui a valu dans un Match Handicap à 2 contre 1 contre Kalisto & Apollo Crews, mais son athlétisme n'a pu lui valoir une victoire à WWE Elimination Chamber.